OP0280. 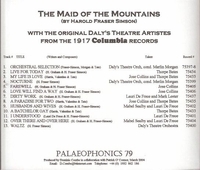 THE MAID OF THE MOUNTAINS - Excerpts (Complete, as recorded) (Harold Fraser-Simson), recorded 1917, w.Merlin Morgan Cond. Daly’s Theatre Orch. ; Jose Collins, Thorpe Bates, Lauri de Frece, Sealby, etc. (England) Palaeophonics 79. Excellent transfers from these 1917 recordings, w.Elaborate ‘The Play’ 20pp. Brochure replete w.photos from the London production. “THE MAID OF THE MOUNTAINS, called in its original score a musical play, is an operetta or musical comedy in three acts. The music was by Harold Fraser-Simson, with additional music by James W. Tate, lyrics by Harry Graham and additional lyrics by Frank Clifford Harris and Valentine, and the book was written by Frederick Lonsdale, best known for his later society comedies such as ON APPROVAL. After an initial try-out at the Prince's Theatre in Manchester on 23 February 1916, the show was rewritten and opened at Daly's Theatre in London on 10 February 1917. THE MAID OF THE MOUNTAINS ran for 1,352 performances in its initial London run—closing mainly because of the nervous exhaustion of its female lead, José Collins. This highly profitable run saved the George Edwardes estate, then being managed by Evett, from bankruptcy. Charlotte Josephine Collins was born in London in 1887 to her mother, music hall performer and comedienne Lottie Collins, who popularized the song ‘Ta-ra-ra Boom-de-ay!’, and her mother's music coach, Stephen Patrick Cooney, who later married, and she then took the name Charlotte Josephine Cooney. Collins got her start as a child performer, and by the age of 17 she had appeared in both pantomime and music hall as a singer and actress. She made her West End début in a principal rôle in THE ANTELOPE (1908). On Broadway, she appeared in VERA VIOLETTA (1911), THE MERRY COUNTESS (1912), and (sharing a duet with Al Jolson) THE WHIRL OF SOCIETY (1912), among others. Her revue appearances included the ZIEGFELD FOLLIES (1913), and THE PASSING SHOW (1914). She also starred in THE HAPPY DAY in London and ALONE AT LAST on Broadway in 1916. Collins played the title role of Teresa, the gypsy bandit maid, in the hit musical THE MAID OF THE MOUNTAINS (1917) to great acclaim, and as a result became known by the nickname of ‘Maid of the Mountains’. In that show, she introduced the songs ‘Love Will Find a Way’ and ‘A Paradise For Two’. Collins played throughout the long run of this show and in many revivals over the years. As a musician, Harold Fraser-Simson is remembered when he is remembered at all for his work in the theatre primarily as a composer of musical comedies. THE MAID OF THE MOUNTAINS made his reputation. This was staged first at the Princes Theatre, Manchester on 23 December 1916 and came to Daly's Theatre for its London run the following February, a run which was not to end until it had clocked up 1352 performances early in 1920. Although one thinks of Fraser-Simson as being responsible for the music, it is ironical that of its three big hits: (‘Love Will Find a Way’, ‘A Paradise for Two’ and ‘A Bachelor Gay’) he composed only the first.